Being Californians, I think that we are quite earthquake aware. And we were aware there was a devastating earthquake in Christchurch several years back, but that was all in the back of our minds when planning a one day beer exploration of the South Island’s largest city. Driving through the darkened streets of Christchurch after a late flight from Sydney, there really wasn’t much to see. All looked perfectly normal. Even the next morning when foraging for a cup of coffee from our just off the city center motel, I saw a few empty lots and a bit of construction. To me, it looked like a city well on the way to recovery. By the time Merideth and I set out for our Christchurch Urban Beer Hike it was a bit warm and sticky. Our plan was for a leisurely three or four stop day that would be our introduction to New Zealand beer. We headed towards the city center which lay in the path to the first brewery stop a couple of miles away in the suburb of Woolston. In a few minutes we reached the Victoria Jubilee Clock Tower. 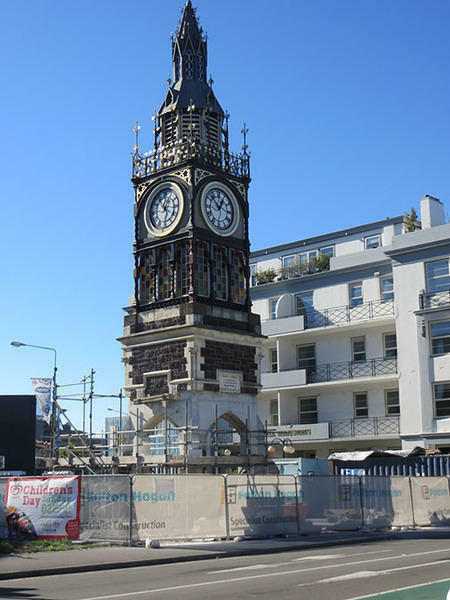 Surrounded by construction fencing, the historic clock was seriously damaged during the earthquake, the face still displaying the time of the disaster, 12:51. Continuing on, we entered what on my tourist map labeled the “Red Zone,” an area of limited access. “Red Zone” probably should have been a clue. Not knowing what to expect, I guess we didn’t expect to find what we saw. We wandered somewhat in disbelief. Block after block of either empty lots or abandoned, tattered office blocks that looked like a set from some post-apocalyptic movie. Every now and then there was a buttressed building facade with no building behind it. Not that there wasn’t hope in all the devastation. Creativity sprouted up here and there. Empty lots hosted every sort of art installation. 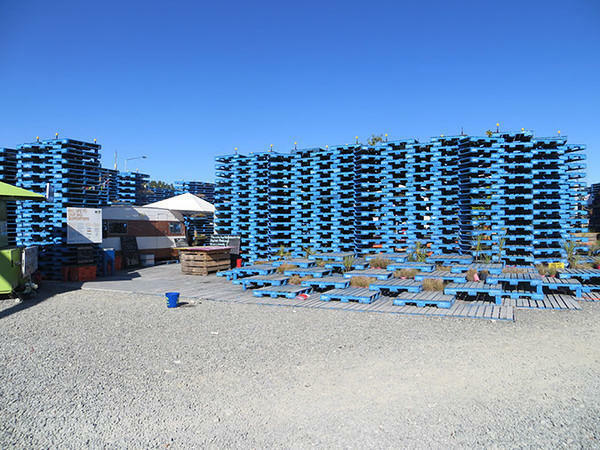 Palette Pavilion, stacks of blue-painted wooden palettes, was part cafe, part garden. 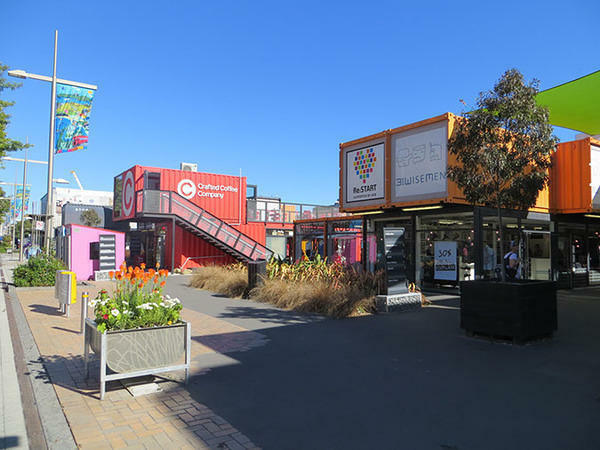 And just off the tram tracks was our favorite, Re:START, a shopping mall made of shipping containers. The eclectic mix of shops drew a good crowd of noontime shoppers. If it only had a beer bar, we would have spent more time there. It was at Re:START that we made an interesting discovery. Reading a earthquake memorial plaque, we realized that coincidentally we were in Christchurch on the 3rd anniversary. Continuing on, it was pretty much more of the same. Somewhat numb, we reached the other end of city center and exited the “Red Zone.” Passing from light industrial to residential, it was a straight shot out to Woolston. In all the sensory overload of the city center, we completely forgot that it was a bit warm. Just when it felt like we had had enough of the heat, we reached our first brewery Cassels & Sons. On arrival, the first thing we noticed were the cool brick buildings, tanneries built in the Victorian era which now were trendy-looking shops. Pre-earthquake, Cassels & Sons was housed in one of these buildings. Destroyed, it was reestablished as a brewpub, called the Brewery, at the front of the same complex, a 1970s building originally slated for demolition. Compared to the somewhat somber mood of the city center, an energetic vibrancy welcomed us as we entered. Walkers, cyclists, bikers, families, and all manner of people were enjoying lunch and a beer or two on a nice Saturday afternoon. 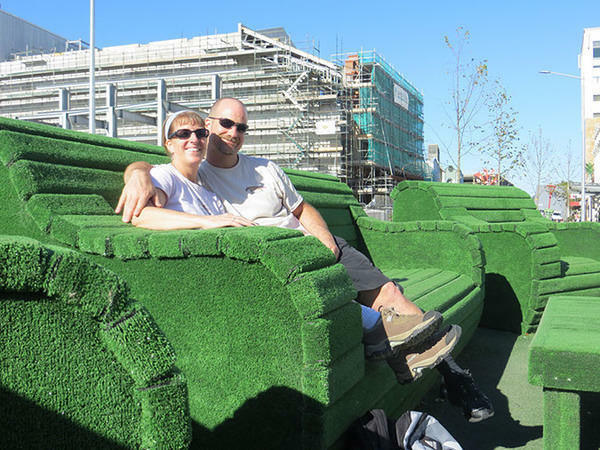 From the ample outdoor seating, Merideth and I chose a quiet corner in the covered section. We quickly ordered the six beer sample paddle. 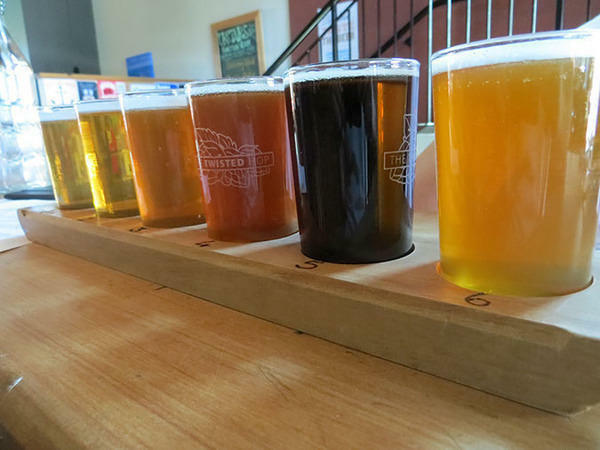 The diverse paddle ranged from Light Owl, a 2.5% ABV Pale Ale to a malty Dunkel that clocked in at 5.6% ABV. 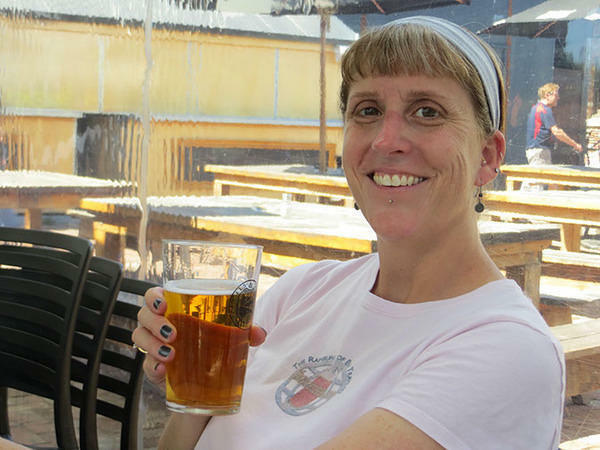 Parched from the long, hot walk, Merideth and I two-fisted the small samples of beer and ice water. Almost lost in the moment was the fact that these were our very first New Zealand beers on New Zealand soil. The honor of the very first went to their 4.8% ABV Lager, a beer perfect for the day. Of the six, my favorite was the what I thought was there IPA. But when I ordered a pint, I was corrected by our waitress. It wasn’t IPA but 1PA (One-PA), a single malt, single hop Pale Ale made with New Zealand Cascades. Very subtle in flavor, this was my baptism into local hops. Our thirst sated, Merideth and I were able to enjoy a nice lunch. We were ready for what the rest of the day had to offer. We didn’t walk all the way to Woolston for just for one brewery. Just a short distance away, mostly through a quaint park, was our New Zealand brewery number two. 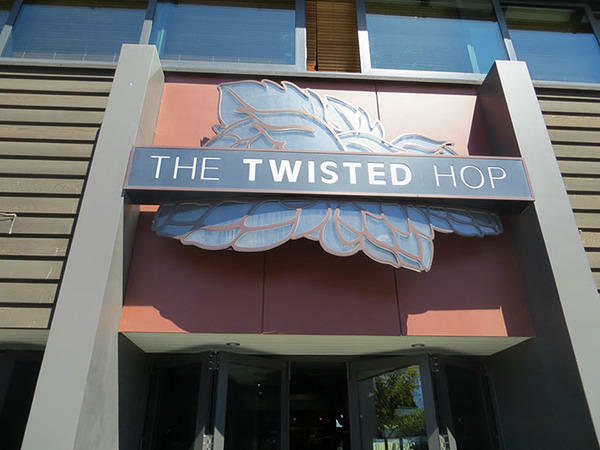 The Twisted Hop was located in the city center prior to the earthquake in a building that since has been demolished. 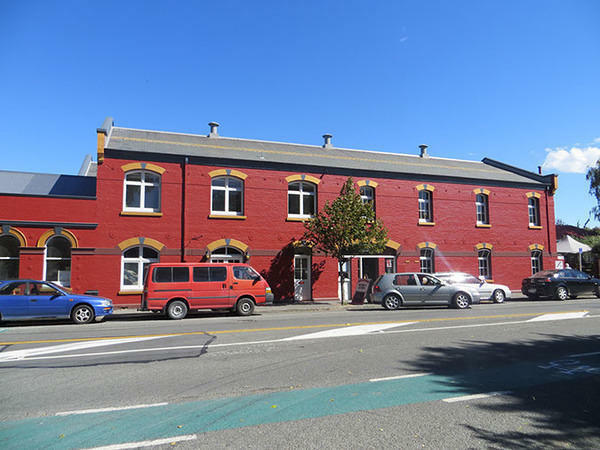 Their Woolston location opened in October 2012. The cool air of the pub was very welcoming and we quickly had our second beer paddle in front of us. Another sextuplet of beers to sample, these ranged towards the lighter side of the spectrum except for the black/brown Twisted Ankle. Despite specializing in English-style cask ales, it was the two lagers with a Kiwi twist that stood out for both of us. The refreshing Pacifckölsch was brewed entirely with New Zealand Pacifica hops, a local version of Hallertauer Mittlefrüh. The star was Sauvin Pilsner, a crisp brew made with New Zealand’s signature hop. Undoubtedly, Pilsner purists would be up in arms but we enjoyed the Kiwi twist on the classic beer style. Sauvin Pilsner, for both of us, was one of the beers of the trip. Somewhat out of character for us, we decided to take the bus back from the Twisted Hop rather than walk. More of a time issue, we did enjoy the air conditioned bus instead of being broiled by the midday sun. Back in the city, we took a rather circuitous route to our final Christchurch beer stop. Housed in an imposing 18th century red brick building, Pomeroy’s Old Brewery Inn bustled with a late afternoon crowd. Families and groups of friends crowded most of the tables inside and out. We grabbed a booth for ourselves. There were two reasons for us to visit the Pom. 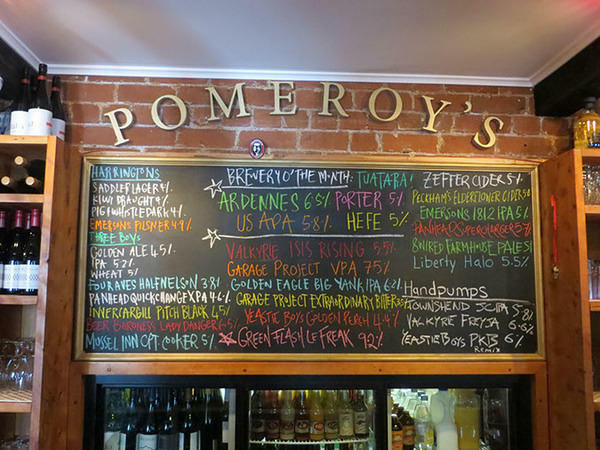 Not only were there 30 plus taps of mostly New Zealand beer but recently they had added an in house brewery, Four Avenues Brewing. We quickly added Four Avenues to the List as there was only one beer to try. Half Nelson, that I am guessing was 50% Nelson Sauvin, was an easy drinking 3.8% ABV English-style Bitter. It paired nicely with the huge plate of crackling. With a few beers still left in us, we chose from the menu two breweries that we knew we weren’t visiting. Farmhouse Pale from 8 Wired was a Pale Ale/Saison hybrid inspired by the brewers visit to Oxbow in Maine. I’ll need to fly back to Maine to try the Oxbow version again for comparison. Yeastie Boys Golden Perch, at 4.4% ABV, was similar in body to the Half Nelson but had much more hop character. Golden Perch was one of my favorite beers of the whole trip. Beered out, we called it a day and wandered back to our motel room. Later that night as we lay in bed, we could hear music and fireworks off in the distance, a commemoration of that terrible day three years ago. Beer travel doesn’t often make us reflective but this was one of those moments we were thankful for the day’s experience.